Back in the summer, we tried to do late-nite at The Main after Friday night hockey. However, the place was super-packed and the chances of us getting a table was as good as not being pissed off shopping at Stupidstore. For those who are unfamiliar with a typical visit to Stupidstore (Superstore), I dare you to not be violated in some way while shopping there. From the frustrating parking lots (apparently, all courtesies such as right of way, signalling for a parking spot, not denting other cars and driving with due care go out the window), free-range kids, people blocking the exit so they can enter with their shopping cart, fighting for the las t box of corn flakes on sale and butting in line, it never fails to be an adventure at Stupidstore. Loved how the clueless lady walked right past the lineup for the self-serve checkouts last time I was there. She walks up to the checkout only to discover it was cash only. I remarked to her that the lineup starts here. She replies by saying that she couldn't use the checkout anyways because she didn't have any cash. Uh... the point has nothing to do with the fact you didn't have any cash! You freakin' skipped the line! Very classy. I truly digress. So we took another chance at The Main after another late Friday game. To our surprise, the place was relatively empty and we finally got our chance to try the food. There was live music playing and it was pretty good. Too bad they cranked it up far too loud. I couldn't even concentrate on eating! Well, not really. Although I think I was losing my hearing. Sweet Tooth and Emilicious decided to share 3 appies and a dessert starting with the Calamari. It was a fairly large portion with a good mix of rings and tentacles. I found the squid to be slightly over-tenderized, however, the crispy non-greasy coating made up for it providing a nice texture. We thought the tzatziki to have a nice tang. 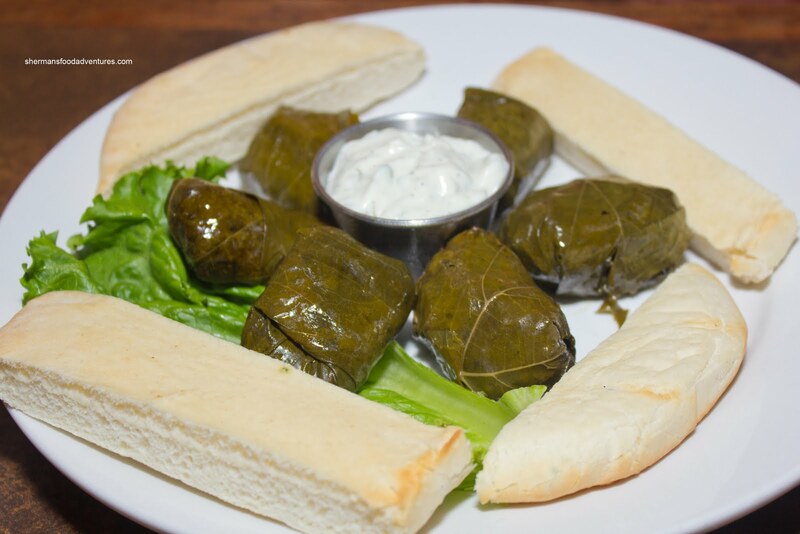 For their second appie, they had the Dolmathes. I found that the rice inside to be on the drier side, but it was flavourful though. I liked the the grape leaves, they retained their integrity while being moist. 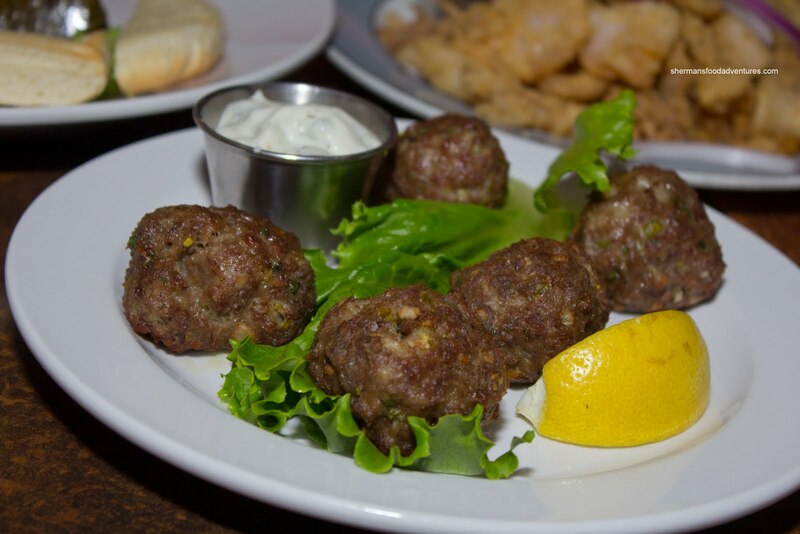 For their last dish, they went for the Keftedes, which in my opinion, was the best of the three. These meatballs were large, moist with an aesthetically-pleasing browned exterior. There was a pronounced onion flavour mixed with a good level of herbiness. For their dessert, they chose the the Bougatsa which I originally mistakened for Galaktobouriko. Well, they are roughly the same consisting of sweet custard sandwiched in between phyllo except galaktobouriko gets soaked in syrup. 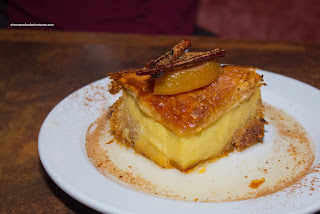 I found the custard to be silky and only semi-sweet, however, the phyllo was far too chewy and hard. This was forgivable though since this was the end of the day and it was an end piece. For myself, I really shouldn't have had a big dinner at midnight, but I couldn't resist the Slow-Roasted Lamb shoulder with Greek salad and potatoes. At first, I was concerned with the lack of colour with the lamb. Those reservations were quashed with my first bite into the moist and tender meat. I would go as far as saying the meat was actually juicy. Hence, there were no dry or stringy parts to this large piece of lamb. 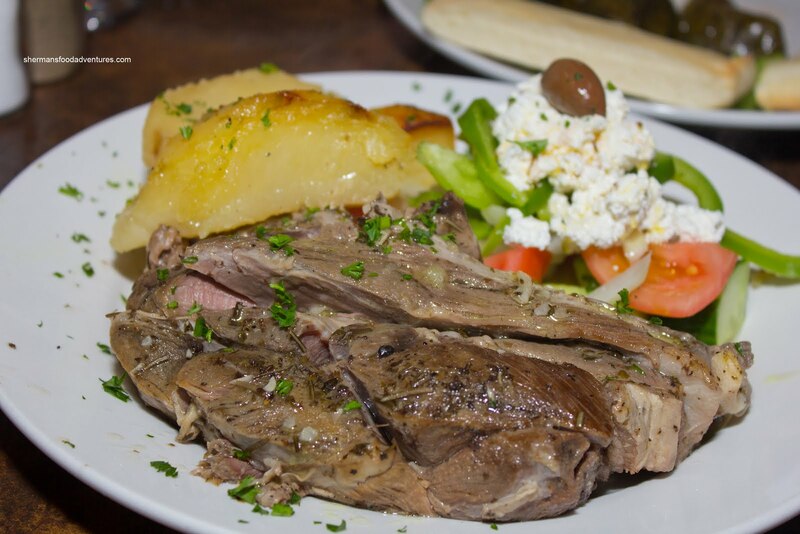 The lamb was very flavourful with just a touch of gaminess and strong lemon hints. The roast potatoes were perfect - soft while not falling apart with good colour. The Greek salad was fresh, topped with plenty of feta and kissed with just enough olive oil and acidity for flavour. As for Gordo, he went for "The Main" Pasta consisting of linguini with chicken, olives, capers, tomatoes, onions, red wine and olive oil. First off, the pasta was served burning hot. How do I know this? Well, the sequence of events that explains it was quite comical. Emilicious was squeezing a lemon onto her meatballs (that is a joke within itself) and it inadvertently squirted on my face (which is another potential joke). This happened while I was in the process of trying the pasta which I dropped onto my napkin. I proceeded to take the napkin to wipe my face of the lemon juice to only find out that the pasta was burning hot! All the while, no one knew what was really going on since the music was so loud. 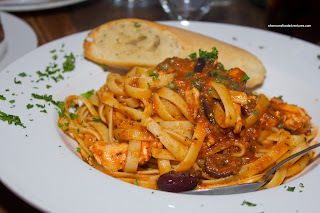 Back on topic, the pasta was not only burning hot, it was full of flavour which was well-balanced. The pasta was a touch past al dente but not overly so. Milhouse has been trying to get his girlish figure back, so he opted for the "The Main" Burger. And he wonders why his diet isn't working... As evidenced in the picture, there was bacon, cheddar, lettuce, tomato, onion and pickles. 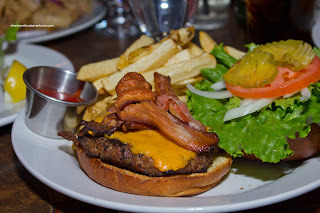 Pretty typical burger with crispy bacon and slight dry patty. Decent, if unspectacular. The fresh cut fries were welcomed, even if they weren't that crispy. Gadget Girl completed the varied dishes at our table with the Classic Pepperoni Pizza. 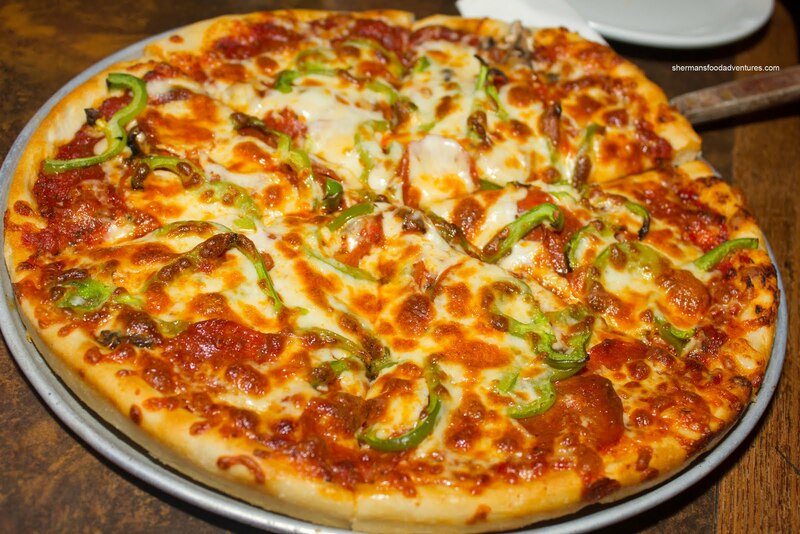 In addition to the pepperoni, there was green peppers and mushrooms with plenty of cheese and zesty sauce. I would call this a pretty typical pizza in the same vain as Gigi's and Sunrise Pizza. Well, was it worth the effort to finally try the Main? I would say yes based on the fact that the food was more than acceptable, especially for late night eats. 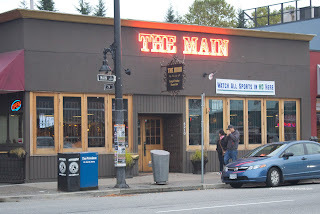 The Main was opened/owned by an older couple Harry and [wife's name = ?] who previously owned/operated Apollonia on Fir near Granville Island. Back then they made a killer roast lamb shoulder, really dang good. 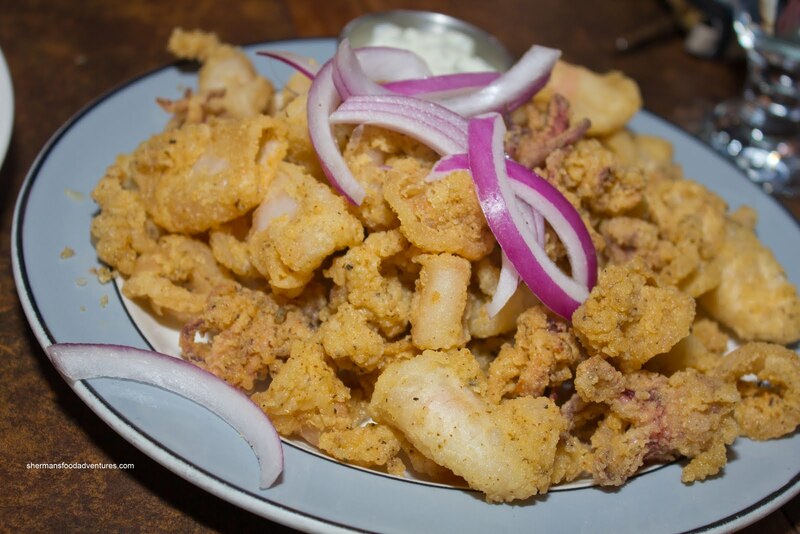 After moving to Main St, they broadened their menu and appealed to a younger, diverse clientele, and the Greek offerings, IMHO, became diluted over time. The Main recently changed hands in 2010. @LR Too bad I didn't get a chance to go before the change. I have been following you for ages and if I see your blog post in a review section and you say something is good, I know it will be good. But... you just compared Gigi's pizza to Sunrise as similar. Gigi's is terrible, whereas Sunrise pizza is like my childhood pizza made of perfect dreams. The picture looks good, but the crust is probably drier than Sunrise. So now I am confused and not sure if I would order a pizza from Main. I might do with a burger, though. @Noddy Well, food is subjective, hence, we can never agree completely with everything. Also, it truly depends on each individual situation (ie. was the food different that day due to chef not being there, or change in chef). So, whether you want to trust me or not is up to you. If you don't you don't, if you do you do. That's life. C'est la vie. Nothing is absolute.